"Stackable Mother's Rings with Initial and Birthstone Rings, Set of 2 in Sterling"
Mother's set of initial and birthstone rings to represent your sweet child. 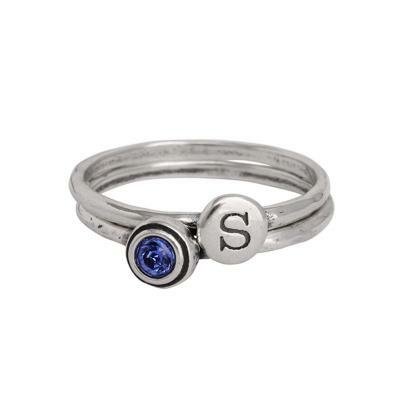 Personalized with an initial and a birthstone to make a special gift for a new mom. Set of two stackable initial and birthstone rings to represent your sweet child. This set makes a wonderful gift for a new mom or a mother of one. All rings are sterling silver. Rings available in all letters and the "&", heart, cross, plus all the birthstone colors.